Michelle Mihlbauer has taken her passion for living a healthy, active lifestyle to the next level. 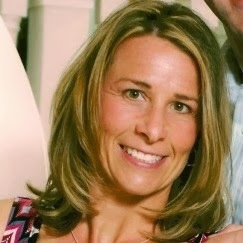 As a Certified Health Coach, Michelle will work with you to achieve your health and wellness goals. Located in the Madison, Wisconsin area, she founded Balance Living with Michelle to assist in finding the balance in your life to live the healthy life you deserve. Here are some tips to help bring in the new you! ENJOY! A lot of people begin the New Year by making resolutions. Taking a vow to lose weight, exercise more or spend more time with family. One starts the year with great intentions, but then quickly relapses into old habits. Why is it so hard to stick to those New Year’s resolutions? · Write down your intentions and keep them in a visible place. Michelle suggests tape to your bedroom mirror or the dashboard of your car. · Get to the source of whatever is keeping you in a rut. Are you in a stressful relationship that causes you to eat a pint of Ben & Jerry’s every night? Are you stressed at your job and feel too tired to exercise after work? If you don’t tackle the root of the behavior, it will be much harder to accomplish your goal. · Be clear about what your life would look like once you achieve your goal. If you resolve to go to the gym more, how will this benefit you? Get connected to the result of your action, and you will be more likely to stick with your plan. · Reward yourself with every little accomplishment. If your intention is to lose weight and you lose 1 pound a week, pamper yourself with a massage. Big changes do not require big leaps. Permanent change is more likely to happen gradually than through one big restrictive plan. Allow time to climb the ladder one rung at a time. If you are looking for some extra help and support with becoming the New You - Michelle is launching a new program in January. Michelle is excited to offer an on line option of Health Coaching at a remarkable price Free (Yes Free), and you don't even have to leave your home. You find the time each day that works for you. Each morning you will receive an email from Michelle that contains tips, toolsand an assignment related to the tips that will assist you in moving forward to take action and make changes. This simple program will educate, inspire, motivate, and guide you to making life long changes. 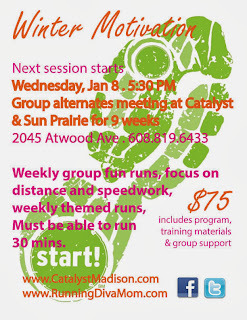 The introductory program starts Monday January 25, 2013. Learn about this incredible program with Balanced Living with Michelle. You may use Oral-B products for yourself, but what are your kiddos using? Oral-B offers a great assortment of kids rechargeable toothbrushes, just like mom and dad are using. Little Dude received the Oral-B Pro-Health For Me Rechargeable Toothbrush and Oral-B Pro Health For Me Sensitive Clean Brush Head Refills. This kid LOVEs contraptions, assembling things and mechanics - so needless to say, brushing his teeth with an electric toothbrush has become a favorite pasttime! The Oral-B Pro-Health for Me Rechargeable Toothbrush is the perfect electric toothbrush for kids. It is designed to cater to the oral health needs of tweens without cramping their style. This electric toothbrush has a waterproof handle with fun designs and is compatible with multiple toothbrush heads. It also features a brushing timer that ensures their brushing style goes the extra mile for the dentist-recommended 2 minutes. This brush head provides a gentle brushing experience. You've gotta know that he loved the two minute timer - it signals to let you know you are done (if you wanna be!). The bristles were also extra soft for smaller teeth and gums. Recognizing that the mouth is the gateway to the body, America's Toothfairy supports the delivery of oral health education and care beginning at the prenatal level. With a growing Affiliate network of exemplary non-profit community programs, the Kids Club, professional and student service programs, America's ToothFairy is creating a powerful, united effort to eliminate tooth decay and protect the smiles of our most vulnerable children. America's Toothfair supports special programs throughout the year to support oral health education - especially at Halloween time when the kiddos are consuming all of those sugary treats. Make sure your kids are brushing their teeth extra well, after sifting through all those goodies that Santa left in their stockings. Join the America's ToothFairy Kids Club and receive educational activities, tips and personalized letters from the ToothFairy! This FREE club was developed to promote healthy smiles for all kids! Join today! 5 – Post about this giveaway on your blog, Facebook or Twitter (@RunningDivaMom @OralB @AmerToothfairy #RunningDivaMom) account. LEAVE ME A COMMENT FOR EACH. Enter now though January 5. I always, always, always love working with TrailHeads and their awesome products. Their Twister Beanie is still my absolute favorite winter running hat. 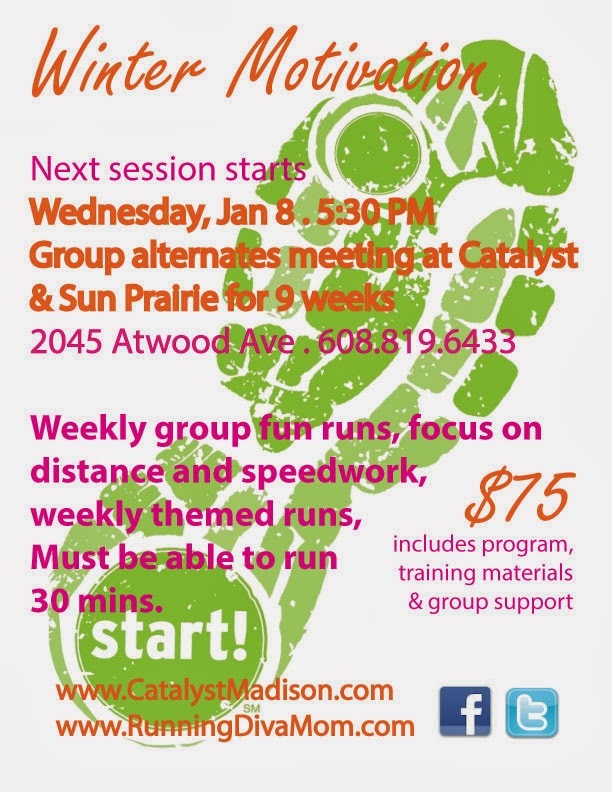 The bright, bold pattern is unique and a conversation piece at almost every group run I attend. And it keeps my head really warm and is super comfortable and soft. I can't say how soft that hat is - it's amazing! I also have a pair of their Twister touch-screen gloves and they are super versatile for running and working my ipod when I get sick of songs And, of course they keep my hands nice and toasty out on the road. I was sent the TrailHeads Goodbye Girl Ponytail Running Cap to test out this fall. I'm not much of a cap running gal anymore, but it's nice to have it on a bright, sunny day - especially since I don't typically run with shades. The cap was super lightweight and didn't give me a "baseball cap headache". The ponytail loop is also super handy. The white mesh kept my head cool, and I loved how the white fabric was accented by the hot pink piping. And the best part for this mama, is it's machine washable. Bonus! 5 – Post about this giveaway on your blog, Facebook or Twitter (@RunningDivaMom @TrailHeadsCT #RunningDivaMom) account. LEAVE ME A COMMENT FOR EACH. Enter now though January 4. Qivana's METABOLIQ System is the world's first weight management system clinically proven and scientifically- engineered to correct the underlying cause of weight gain — your metabolism. 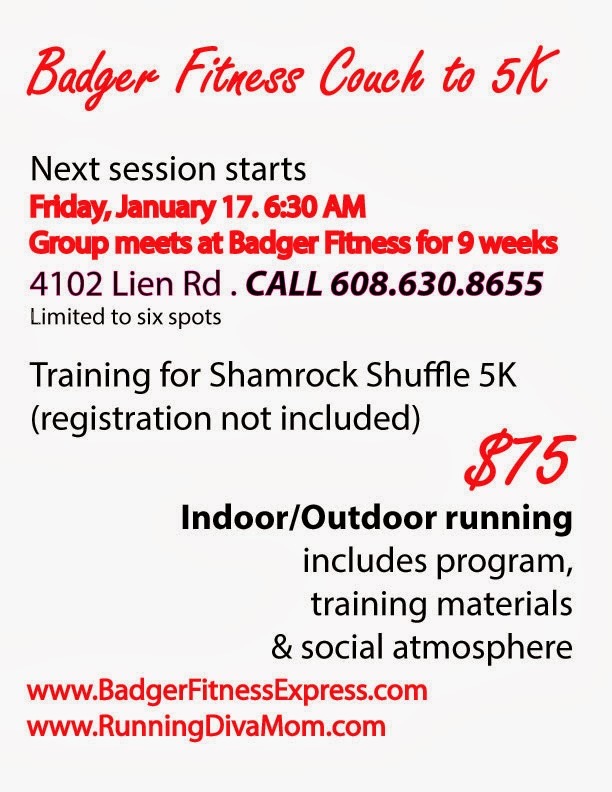 What great timing, with the recent holiday weight-gain and your new year's resolutions and goals right around the corner. Metaboliq can help you kick-start your goals in just ninety days. How??!! Watch the Metaboliq video HERE to learn more. METABOLIQ is unlike any other product or program in the world. It is the world’s first weight management system proven and engineered to correct the underlying cause of weight gain—your metabolism. Metabolic correction doesn’t just band-aid symptoms, but it produces targeted body changes, that make you healthier, and your weight sustainable for the long-term. Developed by the world-leading expert in protein, it includes nutrients at each meal that activate your body’s own fat-burning mechanism, triggered by properly feeding and building lean muscles. The result? Less fat, more lean muscle, superior heath, more energy, a resculpted body – all in just 90 days. This is metabolic correction. This is METABOLIQ. The METABOLIQ Burn pack ensures your successful total body transformation with this elegant step-by-step program. This pack is the ideal system for those who have already completed the Max Burn phase. It is also perfect for those who are looking to maintain their results and need healthy on-the-go meals. Dramatically resculpt your body in as little as 90-days. METABOLIQ Shakes Ignite your metabolic pathways and burn fat for 3-4 hours at a time with this perfectly balanced meal. Not only will it sculpt your body, but we guarantee it’s the best-tasting shake you’ve ever had! Fifteen packs are available in vanilla or chocolate. These shakes taste amazing. I haven't tried them often enough to see any changes, but I do notice that they've kept me from snacking in between meals and kept me fuller longer. METABOLIQ Infusions come in a small package, but pack a big punch. Maximize your nutrition by adding a “Reds” or “Greens” packet to your METABOLIQ Shake, or create the world’s favorite beverage and boost your energy by adding a Mocha packet. METABOLIQ Boost is a blend of powerful weight loss nutrients with a demonstrated ability to increase metabolism, burn calories, reduce body weight, and accelerate fat loss in just 90 days. METABOLIQ Bars are the ideal guilt-free treat that not only satisfy your sweet tooth, but are also infused with the amino acid blend to promote lean muscle building and fat-burning. Transform your body with the mouth watering goodness of a METABOLIQ bar. Available in peanut butter, pomegranate and chocolate. METABOLIQ Resist is will-power in a bottle. This ancient after-meal peppermint has an ability to block your sweet receptors for 2-3 hours. Not only will you be surprised by it’s magic, but you can now break-free from the vicious sweets cycle that sabotage your weight loss. METABOLIQ Recharge is a powerful blend of amino acids ignites the mitochondria in your muscles, increases its fat-burning efficiency, and burns excess fat stores for 2-3 hours at a time. Sold in sets of fifteen packets. Go ahead, and order now ... so that you are ready to kick off your new program next week! 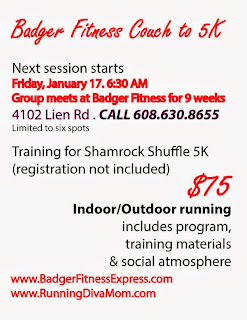 A new year, a new you! Enter now though January 3. Since I started Running Diva Mom, I LOVE supporting local and local, small businesses. I was contacted by Slip Not Headware, a Wisconsin-based company that is selling these adorable slip-free headbands. They are being sold nationally on Etsy as well as in local running stores. And she's a busy, marathoning mom of three. These headbands are stylish headbands for the modern girl, mom, runner, yoga-enthusiast - you name it! These non-slip headbands are available in various thicknesses and sizes and tons of fun, bright patterns and colors. Little Diva and I were sent these adorable, matching headbands. I love the colors and the fun, floral pattern. They look great with your hair tossed up in a pony tail or just to pull those whispies out of your face. They stay in place and don't move. I love the elastic backing on it, too. The prices tend to range from $7-12 on the Etsy shop and are great gifts of a special treat for yourself. They offer various solids and patterns, but also various sports (including running) and sparkly glitter headbands, too. I love the stripes, polka dots and floral patterns. I tend to prefer the thicker headbands for myself and the thinner headbands for Little Diva. 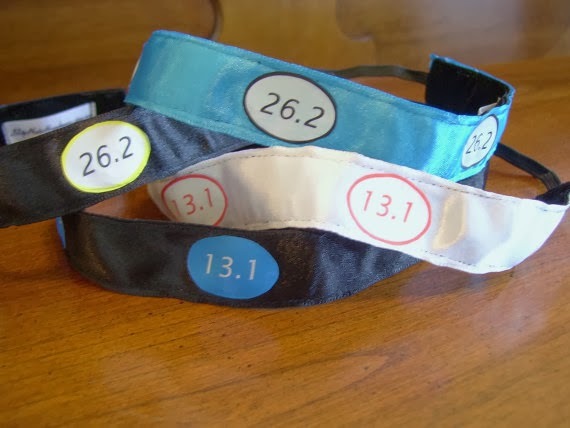 I also love this No Slip Running Headband - available in marathon or half marathon distances. And, they can be customized for you. These retail online for only $12. Enter now though January 1. I was introduced to Something Blue via Etsy and am so glad that the owner contacted me to share her unique pieces with you. Her shop is amazing and there are some super UNIQUE (you will hear this word over and over from me here ...) pieces in her collection. These pieces are hand-crafted and amazing. I received the unique Hand Stamped Marathon Necklace, stamped in roman numerals. The necklace is also available in the half marathon distance - for all you half fanatics! It's available in four different links and retails online for $33. These necklaces were also featured in SHAPE Magazine. A matching bracelet is also available on the Something Blue website. For $35.50, you'll have a unique piece of jewelry around your wrist. I LOVE this dainty, light, unique piece of jewelry. It looks great paired with something dressy or with an old race shirt. Choose the link that works best for you and your neckline. As I mentioned, there are four different lengths available. I really liked the style of the sterling silver chain, too. Shiny, light and a little classy. This necklace is great - but so is the packaging. I loved the "She believe she could ... so she did" box it came in. It makes the necklace even more special and sit close to home for me. If you are a passionate runner, you may also like the cute RUN pendant or if you are newly married, you will want this Mrs necklace. I personally want to add both to my collection. Something Blue doesn't just offer items for runners, they also have state necklaces, mom necklaces, initial necklaces and many personalized items. Great stocking stuffers, holiday gifts, birthday gifts, mother's day gifts, teacher gifts - you name it! Enter now though December 28. Have you heard of HipS-sister waistbands yet? These colorful, multi-functional waistbands are great for active persons, runners and moms-on-the-go who want to be hands-free or just need a few extra spots to store things. They are fashionable and functional and come in several different styles, colors and fabrices. I was sent the Left Coast HipS-sister in pink and loved it. Made of 90% Micropoly and 10% Lycra. Moisture wicking fabric. Retails for $26 and is available in three sizes. This style is available in a super fun polka dot pattern, or eight fabulous colors. I've enjoyed placing a cell phone in my HipS-sister when I coach clients. It's great to be safe and keep a cell phone nearby, in case we have an emergency. It's easy to place my iphone in the HipS-sister and still be hands-free. I'd hate to have to carry my phone with me, and don't have an armband, which is why I typically didn't carry one on me previously. It would also be great for storing gels and other running nutrition. I typically dont' like anything bulky around my waist, but this was comfortable. It also didn't slide around or bounce. It was nice having two pockets as well. I preferred the top load over the side load zippers. The Left Coast sister is where it all started and it has quickly become our most popular design. It offers our shortest band width at about 5". As with all our hipS-sisters, it comes with a front secret top loading pocket ideal for your phone or iPod. It also has both a front and a back zippered 5" pocket for all your other small personal items. The Left Coast sister is perfect for any woman with an active lifestyle. Runners absolutely love it. I also was interested in the Leopard Vegas Sister HipS-sister, but was told that these are their "stylish" sets and aren't the best option for running. They even offer SwimS-sister styles for the active swimmers and for laying around the pool or beach (if you should be so lucky!). 5 – Post about this giveaway on your blog, Facebook or Twitter (@RunningDivaMom @HipsSisterUS #RunningDivaMom) account. LEAVE ME A COMMENT FOR EACH. Enter now though Thursday, December 26. 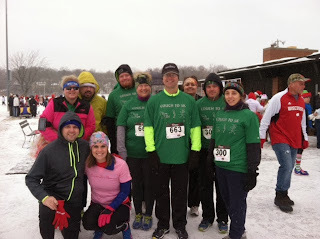 On December 14, we ran Madison's Jingle Bell Run for Arthritis with the latest couch to 5k group. We started with nine couples nine weeks earlier, but after difficult family schedules, illnesses and a frigid fall, we lost unfortunately lost five couples along the way. It was awesome seeing couples bond over nine weeks of training runs, holding hands, talking about their days, and motivating each other. That's exactly why we developed the program for couples. An active "running date night" was what I envisioned. After nine weeks, they toed the really cold startline together. 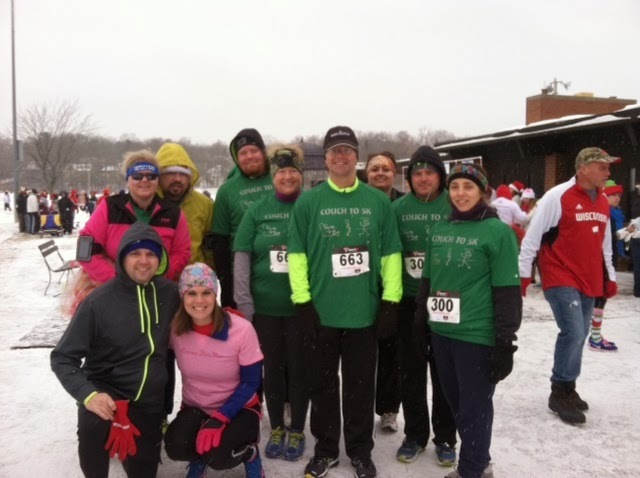 They slipped around together on the snowy 5K course. And they all finished the 3.1 mile journey. My hubby and I couldn't be prouder coaches of these amazing couples. Congratulations - Ginger, Ryan, Brian, Melissa, Trent, Carolyn, Susan and Jim!!! May you have many more active, date nights together! Have you caught the flower power action with Fellow Flowers yet? You may have seen these bright, bold, colorful flowers popping up at various races you've participated in. Female runners have united with these colorful buds attached to their ponytail, Bondi Band or running hat. I first learned of Fellow Flowers last year. I came across them online and then ran into them at various expos around Madison - and then at the Chicago Marathon. Little did I know that one of the co-owners, Mel, lived a matter of miles from me. An entrepreneurial runner, just like myself, I kept in touch with her on and off over the past year. She had been made the leap and was making her mark in the Madison-running community - in a big way. I especially loved seeing the enthusiasm of the young girls at local Girls on the Run events, enjoy the beautiful flowers that Fellow Flowers donated to each GOTR participant. AMAZING. In January of 2011, Tori sent her friends an invitation: Run with me. Her birthday wish was to run through the streets of Green Bay in the CellCom Half Marathon with her tribe of girlfriends. Thirteen of us responded. Why not? Okay fine. I need a reason to get in shape. I’m in. Can’t say no to a party. She’d do it for me. Bring it on. Thirteen friends. Thirteen miles. Meant to be. Despite similar circles, we needed some welcome love. Tori introduced us in an email: Wife meet mother. Teacher meet doctor. Nurse meet businesswoman. Working mom meet working mom. It could have ended with that. Great, we’ll see you all on race day. Good luck to you. But it didn’t. One after another, we began sharing stories. Then reflections. All over email – a clumsy yet effective way to rant, dream, reflect and cheer. It was honest. It was heroic. Usually, we consider time to be the key ingredient in building trust. Yet in 16 weeks, we covered topics like infertility, the loss of a child, abuse and abandonment, the pursuit of happiness, the realization of dreams, admitting fears – big fears – and releasing dreams – epic dreams. And we trained. Amidst juggling kids, families, coaching, jobs, dreams, sleep, making dinner and drinking wine, we trained. On race day, May 15th, we had shared hundreds of emails. Poured out thousands of words. And rallied around one common understanding. We were not running a race. We were celebrating a journey. And the flowers. Oh, our beautiful orange flowers. One might think it was an intentional effort. An orchestrated plan to unite. Hey, we need to make sure everyone knows we’re together – flowers, yeah. Flowers! Nope, we can’t take the credit. A friend of Tori’s knew about our training and in the 11th hour (as in, the week before the race) she handed Tori 14 orange Gerber daisy flowers, lovingly hot-glued with barrettes and clips. You need to be able to find each other. People need to know you’re together. She was genius. Yes! Of course we do. So in a moment’s notice, Fourteen women – powered by friendship – ran with flowers in their hair. Big ol’ orange flowers. We could spot them 100 yards away. And so could hundreds of others. The journey of a flower began. Flash forward to October. Tori runs her first full marathon in Chicago. Running to the beat of a play list inspired by her 13.1 crew. Surrounded by friendship, flowers and signs, and inspired by the pride-filled shouts of her oldest son. Go, Mommy! To him, she is a superhero. Amidst 45,000 runners, a determined bright orange flower crossed the finish line and crushed preconceived notions. She rocked it. Emotions stirred. Feeling the love. Selfless-joy kinda love. This is so much bigger than me. One week later, Mel ran a half marathon to celebrate her October birthday. Women watched in the bathroom as she snugged a big orange daisy into her running cap. Looking fierce, girl. Life had been nudging Mel. Passion had started to call. She was starting to listen. A few meditative moments before the race, channeling the intention of her flower, she told herself, Make a plan. Dream the vision. Uncork the crazy. Lay it down. For the next two hours, she mentally mapped out a business plan in her head. She crossed the finish line with two new lovely and beautiful items – a rose from her oh-so-sweet husband and a razor-sharp clarity of purpose. Later that night Mel texted Tori. I have an idea. Imagine if we could create a way for other women to take this journey? Friendship + Running = Transformation. Are you in? She was. Head over heels in. And here we are. Sharing the journey of the flower with you, with everyone. A dream becomes a goal when you say it out loud. It becomes a plan when you write it down. It becomes your Anthem when you embody it and accept its presence as your destiny. I am so happy to have Mel from Fellow Flowers as one of my mentors. Each flower has a story, a meaning, a great sense of motivation associated with it. After I decided to take my own leap of faith earlier this month, and pursue Running Diva Mom full time, Mel and I were communicating via email about having me host a review and giveaway for YOU lucky readers. I was extremely excited to receive a personal note from her and the beautiful COURAGE tee and green flower - to honor MY JOURNEY WITH RDM! I was born to do this. Which flower are you?? Check out all of the flower colors and the meaning behind each of them. There will definitely be one to describe you and your journey. Fellow Flowers offers a selection of tees and tanks to show off your accomplishments. They are great for working out, or running errands and driving the kids around town. Such great fabrics, women's fit cuts, beautiful, bright colors and fun motivational sayings that you will identify with. The new Awesome Mommy tee is a great top for any multi-tasking mama who is trying to do what's best for her family - and what's best for herself. It retails for $32 on the Fellow Flowers website. 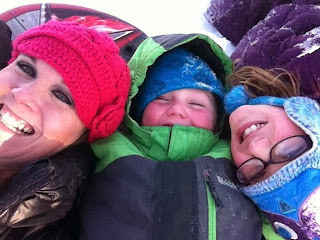 Moms who run aren't selfish...they are awesome. Period. This great fitting tee celebrates moms who hit the pavement and rock their 'mommy' status. Offers a flattering semi-loose fit, giving you plenty of room to run, stretch and lounge. Great by itself or layering. 100% polyester. Runs a little roomy - if you are between sizes, order down! Available in XS - 2X. The Fellow Flowers magnets range fro $2-$4 online and are a great stocking stuffer or secret santa item for that runner in your life. Each one is unique and a great addition to the family fridge to hold up the kiddos' artwork or a fun decoration for your office cubicle. I can't wait to see what my new adventures bring for me in 2014. How about you? If you haven't already purchased your 2014 calendar, you should seriously consider purchasing the 2014 Fellow Flowers calendar filled with all sorts of motivation and quotes each month. What a great way to inspire yourself each and every day of 2014. 5 – Post about this giveaway on your blog, Facebook or Twitter (@RunningDivaMom #RunningDivaMom @FellowFlowers) account. LEAVE ME A COMMENT FOR EACH. Enter now though December 22.